Federal Budget 2019 — Vawdrey Axton Turner. The Federal Budget forecasts a return to surplus of $7.1 billion for 2019-20 financial year. The Coalition’s pre-election budget is promising $158 million of personal income tax cuts over the next decade, small business tax concessions and large infrastructure spending aimed at easing congestion in cities. The Budget ensures tax will be a key battleground in the May 2019 Federal election. The Government is more than doubling the low and middle income tax offset. This is going up from $530 to $1,080 from 2018-19. The new amounts will apply for the 2018-19 financial year which means, provided the Government can legislate these changes in the three Parliamentary sitting days in April, the offset will apply to tax returns lodged from 1 July 2019. From 1 July 2022, the Government is increasing the top threshold of the 19% personal income tax bracket from $41,000, as currently legislated, to $45,000. The Government will also increase the Low Income Tax Offset from $645, as currently legislated, to $700 per year. Taken together, these changes will make up for the removal of the LMITO on 30 June 2022. With the Government's announced changes, from 2024-25, there would only be 3 personal income tax rates – 19%, 30% and 45%. 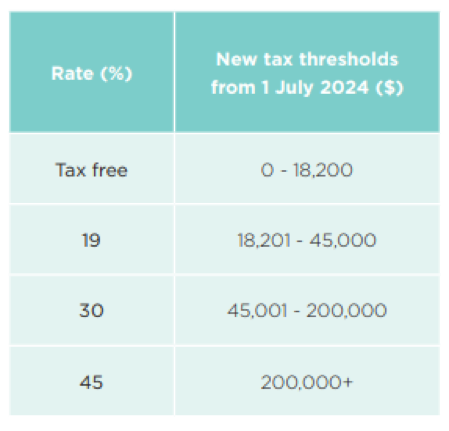 From 1 July 2024, the Government will reduce the 32.5% tax rate to 30%, abolish the 37% tax rate and increase the threshold for the 30% tax rate to $200,000. Therefore, as from 1 July 2024, taxpayers earning between $45,000 and $200,000 will face a marginal tax rate of 30%. This will more closely align the middle tax bracket of the personal income tax system with corporate tax rates. For single seniors and pensioners eligible for SAPTO, the threshold will be increased from $34,758 to $35,418. Small business entities (i.e. those with aggregated annual turnover of less than $10 million) will be able to immediately deduct purchases of eligible assets costing less than $30,000 that are first used, or installed ready for use, from 2 April 2019 to 30 June 2020. They will continue to have access to the simplified depreciation rules. Businesses with aggregated annual turnover between $10 million and $50 million will also be able to immediately deduct purchases of eligible assets costing less than $30,000 that are first used, or installed ready for use from 2 April 2019 to 30 June 2020. The purchase date is critical. The concession will only apply to assets purchased after 2 April 2019 by medium sized business (as they have previously not had access to the instant asset write-off) up to 30 June 2020. The Government will allow voluntary superannuation contributions (both concessional (deductible) and non-concessional) to be made by those aged 65 and 66 without meeting the work test from 1 July 2020. Aligning the work test with the eligibility age for the Age Pension which is scheduled to reach age 67 from 1 July 2023. People aged 65 and 66 will also be able to make up to three years of non-concessional contributions under the bring forward rule, currently limited to $100,000 per annum ($300,000 under the bring-forward rule).. The Government also announced that people up to and including age 74 will be able to receive spouse contributions, currently those aged 70 and over cannot receive spouse contributions. Spouse contributions are contributions to your spouse’s super, which may entitle you to a tax offset if your spouse meets the requirements. The changes will also reduce the incidence of duplicated cover so that individuals are not paying for multiple insurance policies, which they may not be able to claim on. These changes will not prevent anyone who wants insurance from being able to obtain it — low balance and young members will still be able to opt-in to insurance cover within superannuation. The Government will provide a one-off payment of $75 for singles and $62.50 for each member of an eligible couple ($125/couple) who receive a qualifying payment on 2 April 2019 to provide relief from high energy costs. Qualifying payments include the Age Pension, Carer Payment, Disability Support Pension, Parenting Payment Single, and Veterans’ pensions and payments.